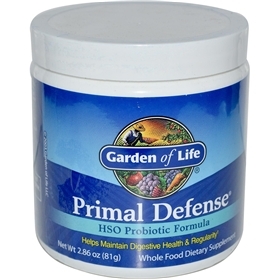 Primal Defense is Garden of Life’s original probiotic formula that is recognized as a leading probiotic in the health food industry with over 4 million bottles sold. It is a unique HSO probiotic formula. In order to obtain the benefits that we historically acquired from consuming foods cultivated in healthy soil, Garden of Life developed a Homeostatic Soil Organism (HSO) Probiotic Blend utilizing 12 species of beneficial microorganisms including Bacillus subtilus, along with fermented grasses and ionic minerals. Designed to balance gut flora, support gastrointestinal and immune health†, Primal Defense comes in two easy-to-use forms: Powder and Caplets. Primal Defense is a blend of 12 species of probiotics, including Homeostatic® Soil Organisms (HSOs), utilizing the Poten-Zyme® process and delivered with a whole food matrix. The HSO probiotic blend in Primal Defense helps promote healthy digestive balance, support normal absorption and assimilation of nutrients, and helps maintain a healthy immune system.† Primal Defense is created using the following probiotic species or their enzymes: Lactobacillus acidophilus; Lactobacillus rhamnosus; Lactobacillus salivarius; Lactobacillus plantarum; Lactobacillus paracasei; Lactobacillus casei; Lactobacillus brevis; Bifidobacterium bifidum; Bifidobacterium breve; Bifidobacterium lactis; Bifidobacterium longum; Bacillus subtilis; and Saccharomyces boulardii.